The RTN Credit Union Waltham location is RTN’s main branch. Our staff is happy to work with you to open an account, assist you with a transaction, or help you with your financial needs. 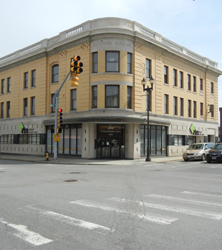 Located at 600 Main Street in Waltham, we are right across the street from Waltham City Hall. Members can park in our large parking lot on Elm Street, and also can reach us by public transportation via MBTA commuter rail (Fitchburg/South Acton line) and several bus lines (go to mbta.com for specific routes and information). Our staff can accommodate members whose first language is Spanish. Latinos En Accion: Latinos En Accion Waltham Mass. Inc.